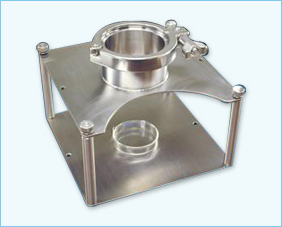 The steel sample stand is an all-stainless construction. An analyzer is easy to move and remove from the sample stand, blender, dryer, or coater. The sensor can be used in laboratory, process scale up and manufacturing. The probe fitting is: 3" sanitary fitting with tri-clover clamp, the fitting dimensions are: ID 2.75" round x 2", and the base dimensions are: 8" square x 3½" H.